The death toll from torrential rains in western Japan reached 88 late Sunday, with over 50 others still missing after massive flooding and landslides destroyed homes and displaced tens of thousands. Rescue operations by Self-Defense Forces personnel and others were continuing in disaster-hit areas early Monday, as Japan's weather agency warned the public of the continuing danger of landslides and flooding. At one point, evacuation orders or advisories were issued for up to 5.9 million people in 19 prefectures, while over 30,000 people were staying at evacuation centres as of Sunday afternoon, according to the Fire and Disaster Management Agency. The number of casualties is expected to rise as damage in affected areas unfolds. Many people are believed to be stranded in their homes due to a lack of access roads because of flooding. 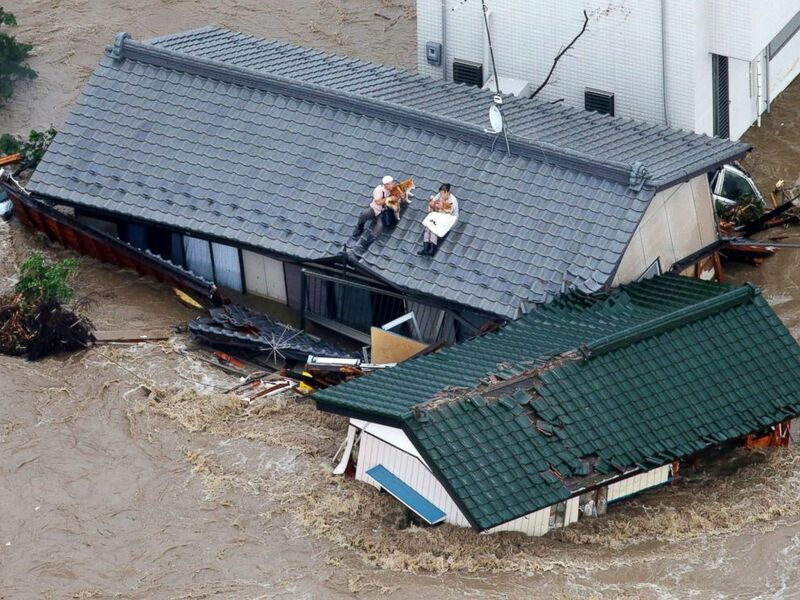 In Okayama Prefecture, one of the hardest-hit areas, more than 1,000 people were temporarily trapped on the roofs of buildings submerged by floods following the bursting of three dykes on the nearby Oda River. Most of them were rescued by boats or helicopters. In the Mabi district, about 1,200 hectares, or one-third of the district, was submerged. About 4,600 homes were inundated in the area. The Ministry of Land, Infrastructure, Transport and Tourism mobilized pumper trucks to drain the inundated area but it is likely to take about two weeks to complete the drainage. Since the downpour began Thursday, 38 people have died in Hiroshima, 21 in Ehime and 13 in Okayama. The other casualties were from Yamaguchi, Kyoto, Gifu, Shiga, Hyogo, Kochi, Fukuoka and Kagoshima prefectures. About 267,000 homes suffered water outages in 11 prefectures as of Sunday. Roads were also damaged and flooded everywhere and many railway sections remain disrupted. According to the transport ministry, 17 railroad operators were suspending services on 56 routes in western Japan or elsewhere. Businesses continued to be affected, with automaker Mazda Motor Corp and Daihatsu Motor Co, a minivehicle making unit of Toyota Motor Corp, suspending operations in factories in Kyoto, Hiroshima and Yamaguchi. The companies decided on the suspension to ensure the safety of employees amid traffic disruptions as well as due to uncertainty over the procurement of auto parts.